In the past werewolves were believed to be people who used magic to transform themselves into wolves, yet retained their human intelligence, anger, and hatred; they used their wolf forms to commit horrible crimes while hiding their identities. The modern idea of werewolves is of people who change against their will into half-wolf, half-human, bipedal monsters with an uncontrollable need to kill on nights of a full moon. So when did the idea of what a werewolf is change? Most modern ideas about werewolves come from just two sources: a 1935 movie called Werewolf of London, and a 1941 movie called The Wolf Man. 1935's Werewolf of London told the story of a scientist who became a werewolf, and was a first for many details that have now become accepted modern 'facts' about werewolves. Story-wise for the first time, becoming a werewolf is involuntary, the trait for changing into a werewolf is transmitted by being bitten by a pre-existing werewolf, the change occurs automatically on nights of the full moon, with the resulting monster being essentially a hairy man with fangs and an uncontrollable need to kill. Overall, the movie had a lot of new ideas... but it flopped in the theatres because the main story the ideas were hung on wasn't terribly original. six years later, though, the new details would mix with a few more new ideas to be come a hollywood classic. The 1941 movie The Wolf Man told the story of Larry Talbot, a man who returns to his family's home in Wales after a long absence. One night, Talbot rescues a young lady by killing a strange wolf that is attacking her, but is bitten as he does so... and after he has killed the creature, it transforms into a person. He realizes with horror that he has been bitten by a werewolf, and is doomed to become one himself; worse still, the curse of the werewolf causes him to destroy those he loves when he is in his monstrous form. The curse also makes him invulnerable to all normal means of destruction; only objects made of silver can kill him. From then on, Talbot transforms at night into a half-wolf, half-man hybrid monster ― looking more like a hairy man than a wolf ― and then he roams the foggy countryside looking for people to kill. Talbot is horrified by what he’s unwillingly become; after various attempts to restrain or cure himself, his monstrous form tries to attack the woman he loves and he is accidentally killed by his own father who is carrying Talbot’s silver-tipped cane. The Wolf Man proved popular enough to spawn four sequels, and thanks to these films, most people now believe that a werewolf is a hairy, wolf-like person, that uncontrollably transforms into a monster during full moons, can only be killed with silver, and can create new werewolves by biting people... which is nothing like the original werewolves. The strange thing about all of this is that, even though this sort of werewolf has only been made up within the past century, there are now people who claim to have actually seen them. Since this type of werewolf is just a creation of monster movies, these people are likely seeing things that remind them of these movie monsters, and so they tend to label what they’ve seen as a werewolf ― whether or not it was. Since at least 1989, people in Wisconsin, in the United States, have been seeing a hairy, man-like creature with a dog-like snout, and pointed ears. Dubbed the “Bray Road Beast” after Bray Road near the town of Elkhorn, where the beast was first reported, it has been mistaken several times for a large dog... until it stood up! Attempts to follow it have so far failed. In Scotland there have been reports of hairy humans with wolf heads; they can stand and walk on two legs, but drop to all four limbs to run. The first was seen in the 1950’s from a distance of about 70 feet while it was near Loch Morar; the second was seen near the town of Oban in 1967 late at night as it ran at high speed past a mail truck making deliveries. More recently, on the night of August 19, 2016, three people driving out to pick up pizzas in Halsham, England, saw a large canine-like creature on the side of the road ahead of them. As the car approached, the creature raised up onto two legs and turned towards the car, revealing a "human-like" face... then it turned, dropped to all four legs, and ran off across a nearby field, vanishing into the dark. In all of these cases, some sort of bipedal, canine-like creature was seen, which matches a movie werewolf in appearance; but none of these creatures were seen to become human, so it is not fair to label them werewolves. So, as stated before, movie werewolves don’t exist... but strange, bipedal, dog-like monsters might! American Hauntings: Unexplained America: The Bray Road Beast, by Troy Taylor, 2008 website. Online: Click here! 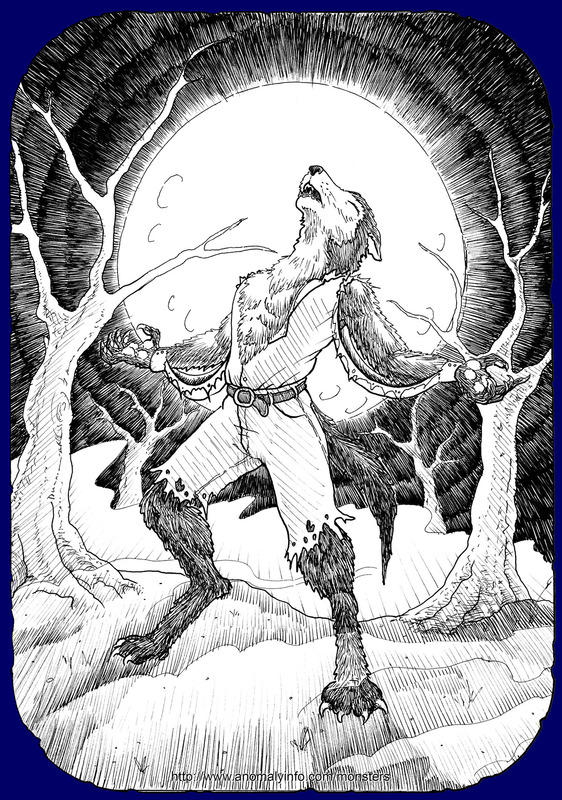 Cryptomundo: The Werewolves of Britain, by Nick Redfern, article in the 2006 website maintained by Loren Coleman. Online: Click here! Werewolf of London, page in the Wikipedia website, viewed 2-13-2017. Online: Click here! The Wolf Man (movie), written by Curt Siodmak, directed by george Waggner, starring Lon Chaney, Jr., 1941 Universal Pictures. Online: Click here! "2016, August 19: Werewolf Encountered in Halsham, England," by Garth Haslam, article in the Anomalies: The Strange & Unexplained website, viewed 2-13-2017. Online: Click here!